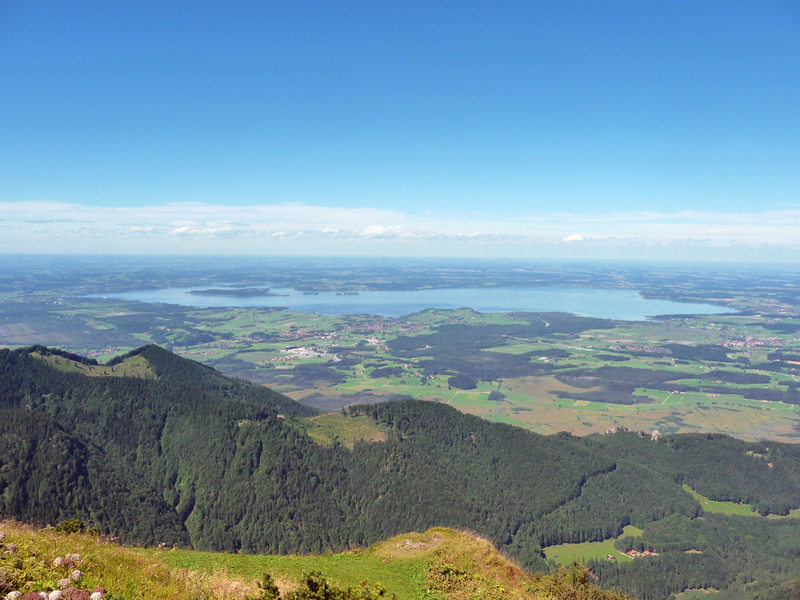 With 80 km² and 64 km of shoreline, Chiemsee is the largest Bavarian lake, popularly known as the „Bavarian Sea“ and is considered the most beautiful lake for swimming in Germany. Lake Chiemsee is located at the foot of the Alps, gently embedded between the hills and the magnificent panorama of the Chiemgau Alps. It originated about 10,000 years ago after the excavation of a glacier and was originally about 240 km² in size. 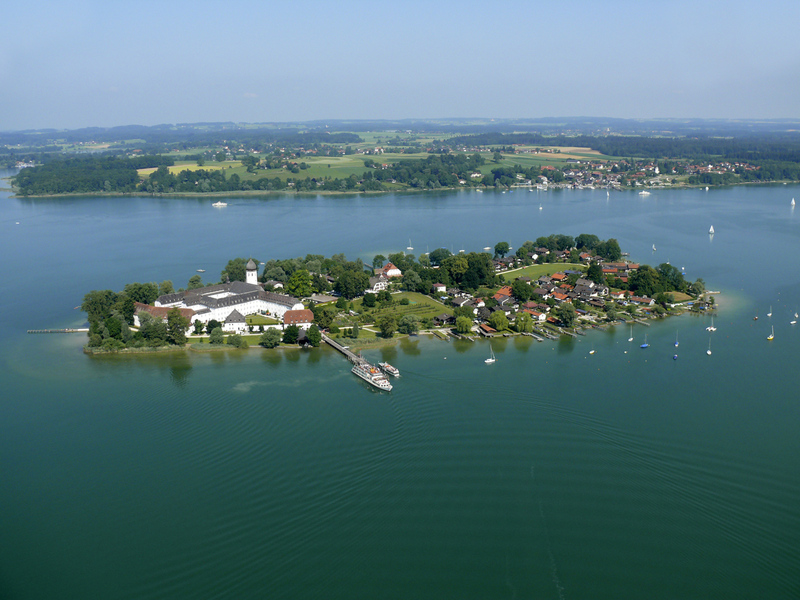 Its islands, Fraueninsel and Herreninsel, with the famous Herrenchiemsee Castle, are tourist highlights which can be reached by boat from Gstadt in about 10 minutes or as part of a Chiemsee cruise. 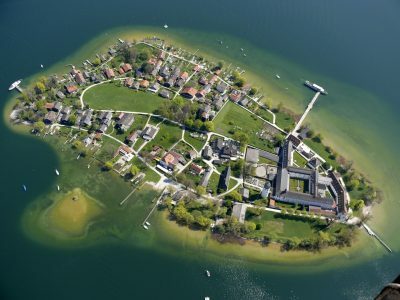 The two smaller islands of the Chiemsee, Krautinsel (3.5 ha) and Schalch (22 m²) are uninhabited and not visited by the ferries. 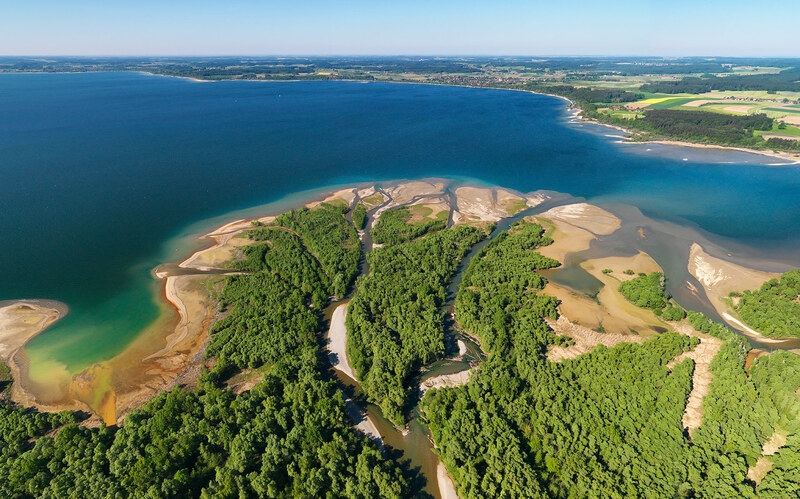 Another interesting attraction is the delta of the Tyrolean Ache in Übersee. Fraueninsel island, together with Herreninsel, forms the smallest municipality in Bavaria with approx. 230 inhabitants. With a total of 256.8 ha. it is also Bavaria’s second smallest municipality in size. Fraueninsel is a car-free area and the second largest of the three islands. It takes about 20 minutes to walk its circumference. It is densely populated, with the „islanders“ predominantly living from fishing, gastronomy, crafts and holiday room rentals. The center of Fraueninsel is the 1200 years old abbey, Frauenwörth, the pilgrimage site for Irmengard, the patron saint of Chiemgau, with her convent church and the Carolingian wall-painted gatehouse, which is the oldest building in Southern Germany. The Torhalle is also well known for its summer exhibits of the old Chiemsee painters. The convent is a popular venue for seminars and workshops. In the convent shop (“Klosterladen”) you can find herbal remedies, the famous convent liqueur, marzipan, gingerbread, books and local souvenirs. There is also a wide range of gastronomic offerings: whether in one of the oldest inns in Bavaria or in one of the cosy fisherman’s beer gardens – there are more than enough nice spots to be found on the island. Not to be forgotten is the beautiful Christkindl Market every year at Advent. 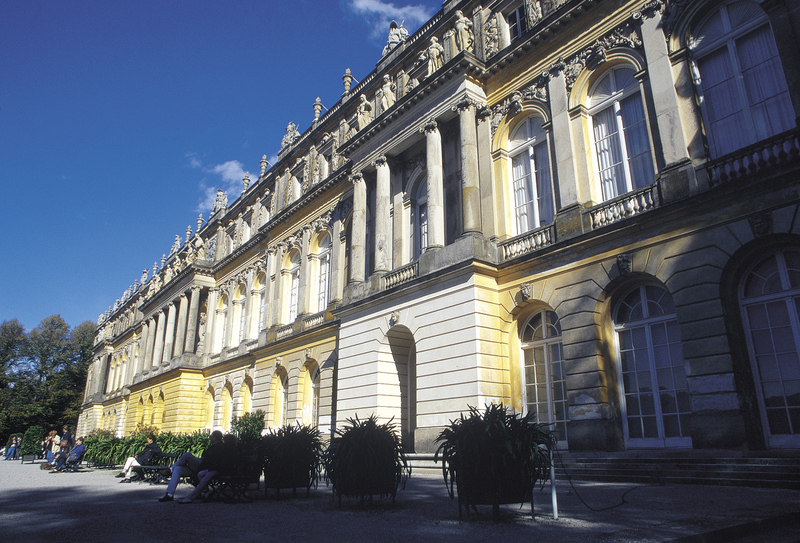 A highlight of Chiemgau is Herreninsel with the world-famous Herrenchiemsee Castle. It was built at the end of the 19th century by Ludwig II, also known as the fairy-tale king, as a replica of the Palace of Versailles. Whether you ride in a romantic carriage from the boat pier to the castle or walk through the tree lined avenues, there is ample reason to be impressed: royal parks with glittering fountains and baroque splendor with the mirrored hall and sumptuous state-rooms give us a taste of the fairy tale king’s world. The second landmark next to the castle is the former monastery of Herreninsel, Herrenwörth, founded between 620 and 629 by Eustasius, Abbot of the Monastery Luxeuil (Burgundy). Between the foundation and 1130 it was a Benedictine monastery, and after 1130 it became an Abbey of the Augustinian male choir, which was dissolved during secularization in 1803. In August 1948, the German Constitution was drafted and signed in the Convention Hall of the Old Castle, exhibited in the impressive museum with two connecting galleries of the old Chiemsee artists and a Julius Exter exhibition, as well as the magnificent “Kaisersaal” (emperors’ hall). These sights are included in the entrance ticket for the castle. 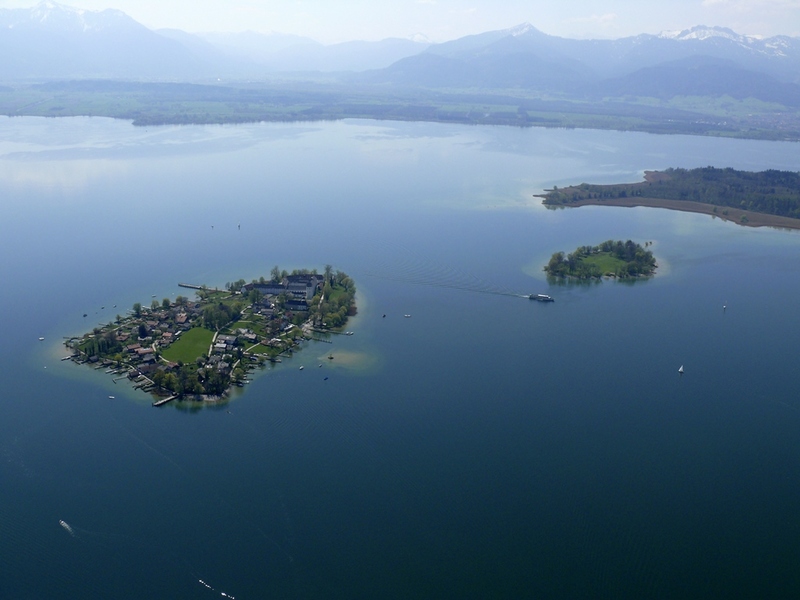 The third and smallest of our Chiemsee islands is the uninhabited Krautinsel with an area of 3,5 ha. For centuries it supplied the vegetable and herbal supplies for both monasteries. Today, it is used mainly as a pasture for sheep in summer, and is not visited by the ferries. This presumably man-made island is located about 66 m west of the Fraueninsel and marks a dangerously shallow area for sailing boats. Around 1935 the artists‘ community of the Fraueninsel planted a weeping willow tree, which unfortunately fell victim to a storm a few years ago. In the meantime, however, there is a newly planted willow tree. accessible Circular track around the island of Fraueninsel is suitable for wheelchairs; access by the Chiemsee Ferry. accessible Elevator available, barrier-free sightseeing possible. Public toilets with disabled access are available in the Augustiner Chorherrenstift, at the cashier’s office on the pier and in the New Castle.